Thanks to the ergonomic design it is easy to get into the lower edges of the window and the included accessory, the belt clip, makes it possible to keep the sprayer or the washer mounted in your waistband avoiding you to bend down all the time to switch device. This device is operated by one hand and therefore Nilfisk Smart is light-weighted and cleaning is made user-friendly and easy. With a 100 ml. dirty water container you do not have to empty the tank all the time and it is quick to get the job done. 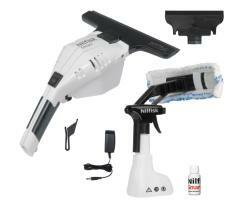 The Nilfisk Smart comes with a lithium battery which ensures a run time of 25 minutes.